Last Thursday, my friend and fellow member of the S Scale Workshop, Fredrick Adlhoch emailed with a last-minute request. He and his partner were going to be in town Friday morning – could they drop by, briefly, to see the layout? As it turned out, I had a 9:00 am meeting at home on Friday, and needed to leave by 11:30 for a lunchtime appointment – but I had a 90-minute window and it dovetailed nicely with Fredrick’s free time. I’m glad it worked out, because it was Fredrick’s first opportunity to see the layout in person. One of his comments that stuck with me was the observation that seeing the layout in person helped him put into context the many vignettes that I’ve shared via photos on this blog. In the above overview photo of Port Rowan, one can see the apple orchards, the elevated coal delivery track, the section house and its oil shack, the turntable, the barn at the team track and – near the end of the peninsula – the mockups for the station and feed mill. 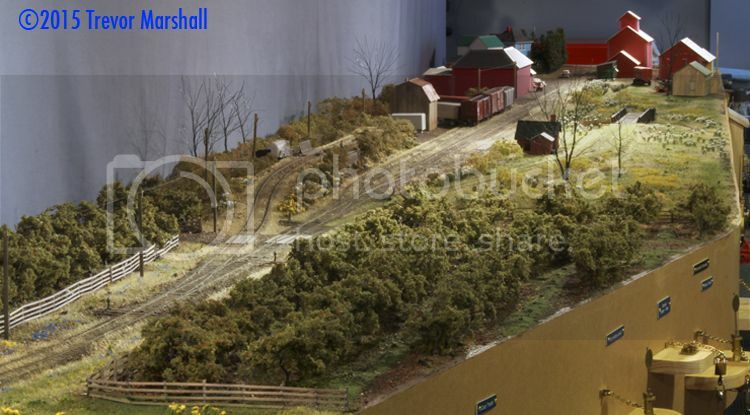 When I photograph the layout, I tend to focus on these areas. I have favourite compositions, which I have discovered while peering through the viewfinder on my camera. These are the combinations of scenery, trains, lighting and camera position that tell a compelling story. And I tend to photograph variations of those favourite compositions. It’s not that I ignore others – I’m always looking for new ways to view, photograph and share the layout – but that they are the ones that I find most convincing. As such, I rarely take overview photographs. The exceptions tend to be photos used to illustrate something related to ergonomics or lighting. I also share overview photos on the anniversary of starting the layout, because they help document my progress from year to year. Great to see you, Fredrick – come back when you have more time and we’ll run some trains!